I’ve had some exciting results to my experiments with culturing C. metallidurans on contaminated tailings from the Montague site. For the experiments, I prepared fresh nutrient broth in 30mL aliquots, added approx. 3mL of tailings soil and then 1mL of live bacteria culture, and incubated the entire concoction at 30˚C for 2-3 days. When I looked at the cultures under a microscope after the incubation period, what I witnessed was delightful, and a bit perplexing. The C. metallidurans seemed to be having a party — they were that lively. They seem to have survived very well in an approximate 10% toxicant solution, navigating around the microparticles of tailings like in a little roller derby. This animation doesn’t quite do justice to the proliferation of C. metallidurans but gives a quick visual on the interaction of C. metallidurans with whatever other microbes are present in the sample culture. What was perplexing, however, is that there was some other microbe present in one of the control tubes that I had not added C. metallidurans to (I had just added some of the nutrient media and incubated them). It’s perplexing because these were mostly a singular, isolated species. Environments will typically have a multitude of species of microbial community members. These were quite long rod-like bacteria, and all were completely immobilized – some streptobacilli and some diplobacilli present. The control culture (no C. metallidurans inoculant). Also perplexing is that this species was only minimally present in the cultures inoculated with the C. metallidurans. They had been either crowded out by the new inoculant or just didn’t survive the 30˚ temperatures, or didn’t like the nutrient media. Chances are, the 30˚ was too warm for them, but it’s also curious that they didn’t appear in my first soil dilutions which were cultured at a wide range of temperatures and contained no nutrient media. I’d have to send them off for a genetic ID at another lab in order to know what they are, but I can say with certainty that they are not C. metallidurans. I can also say with more confidence now that C. metallidurans might survive well in the tailings, despite what other microbes may be present. 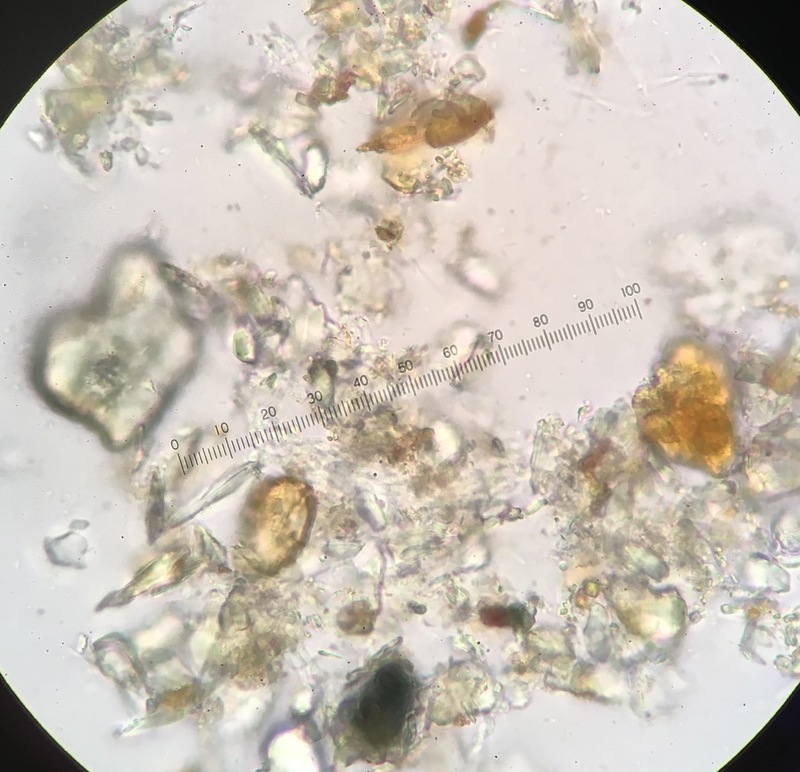 There were other infrequent microbes present as well, but in the culture experiments overall, the dominant strain in my tailings cultures, at 30˚C at least, appears to be the C. metallidurans. My next experiments will be to culture the full concentrate of tailings samples, with just a few drops of inoculant and nutrient media. I’ll do this and incubate them at both 30˚ and at room temperature (22-24˚), as well as at 4˚C. This will most closely simulate the conditions of the future bacteria bombs I plan to prepare for a site offering. I also need to culture the Muddy Pond samples to see what that micro-ecology looks like. Linda is also interested in the Stamp Mill site, which contains the most gold of all the sites we’ve visited so far. Site inoculation will most certainly not see any results immediately, if there are to be any — mid- to late summer would be the time when the activity would be best, as the microbes would be within their optimal temperature range. It is possible that they (the bacteria bombs) will reinvigorate at that time, and get to work in the tailings. Also, as Linda so aptly pointed out, any remediation here will be an interspecies remediation – involving not one singular approach but also the goldenrod or whatever other phyto- or other remediation strategy is employed. I doubt the bacteria could do it alone! IOTA will be bringing me back to Halifax in May 2019 for a bioart conference, and at that time, I will do a follow up to see if my little buddies managed to stick around onsite. This might be a very nice community activity.